The program will open with a concert version of Paquita and will feature the grande pas classique from the full-length ballet. The staging will be by Hilton Head Dance Theatre’s artistic director Karena Brock-Carlyle after the Marius Petipa version, staged by Natalia Makarova for American Ballet Theatre. The roles of the newlyweds, Paquita and Lucien, will be danced by Marina Karis and guest artist Journy Wilkes-Davis. 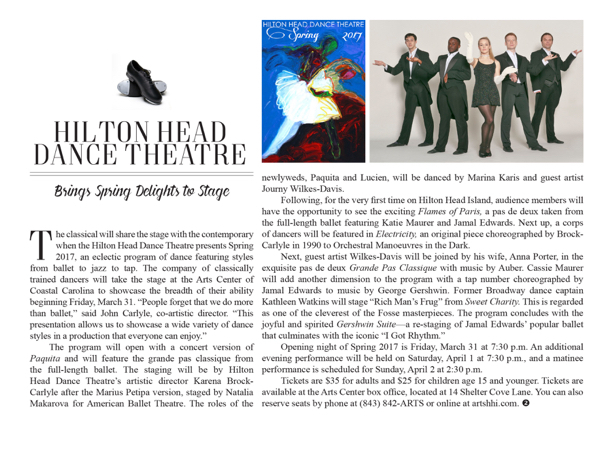 Following, for the very first time on Hilton Head Island, audience members will have the opportunity to see the exciting Flames of Paris, a pas de deux taken from the full-length ballet featuring Katie Maurer and Jamal Edwards. Next up, a corps of dancers will be featured in Electricity, an original piece choreographed by Brock-Carlyle in 1990 to Orchestral Manoeuvres in the Dark. Opening night of Spring 2017 is Friday, March 31 at 7:30 p.m. An additional evening performance will be held on Saturday, April 1 at 7:30 p.m., and a matinee performance is scheduled for Sunday, April 2 at 2:30 p.m.
Tickets are $35 for adults and $25 for children age 15 and younger. Tickets are available at the Arts Center box office, located at 14 Shelter Cove Lane. You can also reserve seats by phone at (843) 842-ARTS or online at artshhi.com.